Starbucks recently cranked up its focus on offering dairy alternatives by adding a coconut milk-based espresso drink to its menu for the first time. And now, in response to huge demand from customers, the coffee giant has revealed plans to offer another non-dairy milk option -- and it's a big one: almond milk. Starbucks announced Monday night that it plans to roll out a new, custom-recipe almond milk to more than 4,600 locations in some regions of the US on September 6th and to all its stores nationwide by the end of the month. 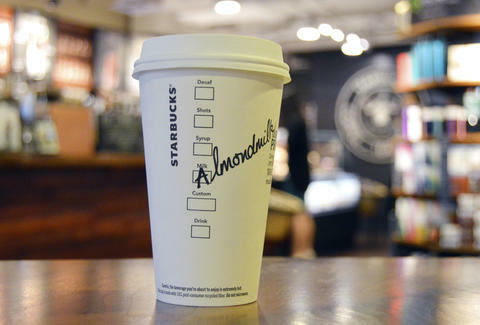 Dubbed Starbucks Almondmilk, the recipe is designed to "complement" both hot espresso drinks and cold espresso drinks. A splash in your brewed coffee is probably tasty, too. Starbucks first introduced soy milk at its stores back in 2004, followed by Starbucks Coconutmilk just last year. The latter dairy alternative is one of the key ingredients in the the so-called Pink Drink secret menu item that quickly took over Instagram a couple months ago. Imagine what the Rainbow Drink slurping maniacs will create with almond milk, or, you know, just wait till it's all over your feed in a few weeks. Tony Merevick is Cities News Editor at Thrillist and enjoys almond milk every once in a while. Send news tips to news@thrillist.com and follow him on Twitter @tonymerevick.